Blue Lynx had the opportunity to once again attend the biggest HR Event of the Netherlands, HR LIVE at the Fokker Terminal in The Hague. HR Manager Arla Morrison and CFO Dina van Duuren-Timmermans represented Blue Lynx at HR Live 2018, where they participated in numerous workshops, spoke with existing and new partners and suppliers and enjoyed a meaningful day geared towards sharing, expanding and developing not only their own HR knowledge and expertise but that of Blue Lynx as a whole. Workshops included learning about trends in the labour market, remuneration in 2018/2019, legal updates, payroll changes, GDPR, illness management and prevention, global workforce planning, management and leadership and the sometimes daunting WKR (Werkkostenregeling). Each year that Blue Lynx attends, the number of visitors, diversity of workshops and variety of suppliers increases and improves. It is a great opportunity to network with like-minded individuals and learn from our fellow HR professionals. Blue Lynx is always looking to improve and expand upon our HR Services and Solutions division. 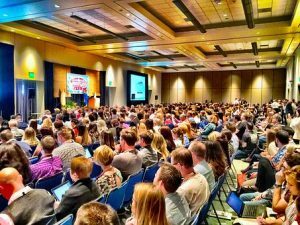 By attending events like HR Live, we are able to contribute towards this improvement and are also able to take the time to reflect on our service offering and ensure we are catering to our client’s needs, wants and most importantly, in line with current market trends, labour laws and legislation. This enables us to provide accurate support and information to both our internal and external clients. Blue Lynx appreciates and encourages learning opportunities and is thankful to have a platform to develop their staff enabling ultimately better support, customer service and expert knowledge for and to their clients. We can’t wait to see what next year’s event has to offer. For more information about The Blue Lynx Services offering please send an email to HR@bluelynx.com or phone +31 703117822.